Accessories are a way of specifying that additional items are rented or sold with a particular product. Every opportunity is different, so when adding a product with accessories to an opportunity, Current RMS provides a breakdown of those accessories so you can choose which you’d like to add. When an accessory is set up as “default,” the quantity of that product is added by default when you pick the parent product on an opportunity. You may adjust this. When “mandatory”, the quantity of the accessory product is added by default when you pick the parent product. You cannot enter a quantity lower than the mandatory amount. When “optional,” no quantity is specified and you can set the amount you’d like to add when adding the parent product. For products with accessories, you’ll see a “Show accessories” link under the product description once you’ve performed a search. Hit this to expand all accessories for that product, including their availability figures. Enter a quantity for the parent product to start adding quantities for your accessories. There are labels indicating whether your accessory is optional, default, or mandatory. Quantities for optional accessories are set to 0. Adjust the quantity as you wish. Default accessories have the quantity set to the number you specified when creating the accessory in Resources > Products. You may change this here if the opportunity needs greater or fewer. Mandatory accessories have the quantity set to the number you specified when creating the accessory. You may increase the amount, but you can’t enter less than the mandatory quantity here. If you don’t expand the accessories list and simply enter a quantity for the parent product, Current will automatically add default and mandatory accessories with the quantity you specified when creating the accessory. Optional accessories won’t be added. If you change the quantity of the parent product, accessory quantities will be updated to reflect this change. After you’ve selected a product, if the product has accessories then a new “Accessories” section will appear. Quantities are automatically filled in for you based on the quantity of the parent product. What if I don’t have stock of an accessory? when a “default” accessory has a shortage, its quantity is adjusted to match the quantity that’s available and a warning is displayed. when a “mandatory” or “optional” accessory has a shortage, the system won’t allow you to add that quantity to the opportunity. 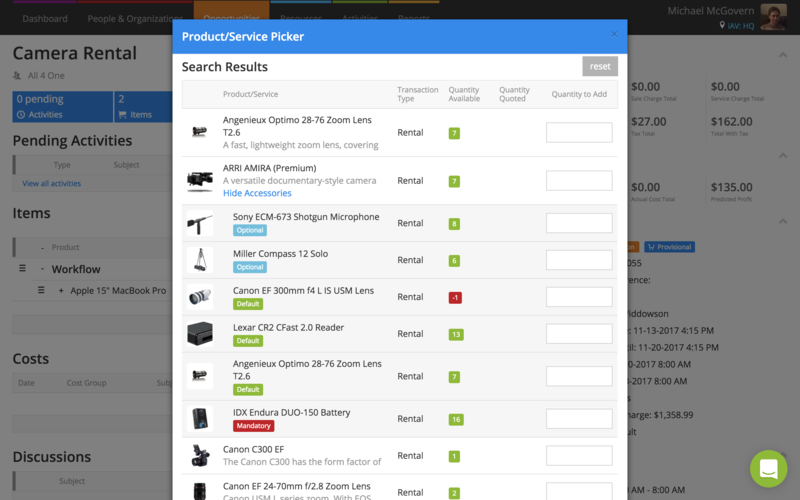 Remember availability figures for accessories are shown in the picker and in the add new item screen, so you know exactly how much stock you have available to add.